One of the biggest issues in today’s society is the propensity to complain over the ability to solve. I can probably end the article right now but i would not be offering solutions if i did that. 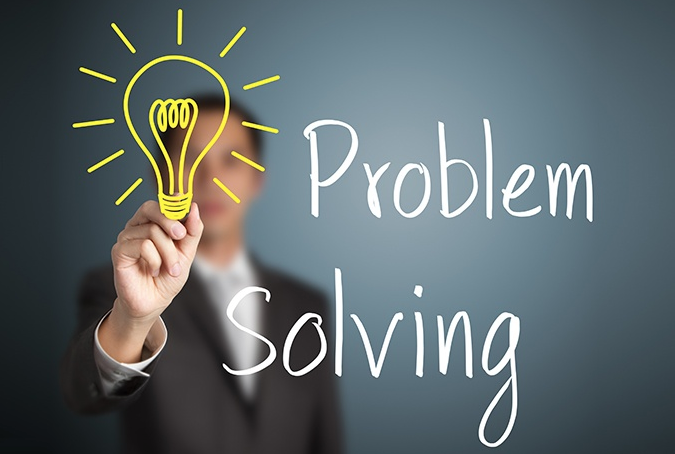 So here are some important things that I have seen and how we can begin to THINK along the lines of solving problems. If we begin to solve problems instead of just complaining we will get to a place where we can make better teams, better businesses, and better people. I have owned my own company for 16 years now and have coached football for 17, many of those years as a head coach. Along the way I have dealt with and seen some of the most interesting things that come out of these very different approaches to life and everything you do. #1 Don’t get caught in the GROUP THINK TRAP. Just because a few disgruntled people with bad attitudes who hate their own lives recruit you to join their clique of disgruntled thoughts, come up with your own thoughts. Group Think is simply the old adage “Misery loves company”. I have learned over the years to distance myself from those people, because they end up going down a bad path. They make decisions based of the immediate wind blowing and not the long term. They may also succeed in their objectives in the short run but in the long run, people start to discuss those individuals with a but word. Simply but they will be branded with “He’s smart but watch your back”. If you allow that to happen to you then you will have major issues in the long run. My advice is always think for yourself and do not get caught up in gossip and innuendo. Find the facts, talk to the individuals that can help you and figure out how you can figure out a way to solve the problem not fester it. #2 Get FACTS for each situation. I firmly believe your job in any problem situation or something that may be an issue is to get the facts. The best way to get the facts is to go to the source and then offer ideas, solutions and actions. Never ever gossip, talk in circles or create solutions by discussing things with anyone other than the source. If you can create the ability to go to the source and get the facts you will then see a better perspective and understand a way to help the source of the problem create a solution and they will be eternally grateful. I firmly guarantee it. #3 Do not complain and gossip. There is a difference between gossiping and spreading rumours that make problems worse and discussing issues and figure out solutions. Gossiping is something like “ Can you believe the head coach yelled at him like that, if I was a player I would never take that.”, a better way to handle it would be to approach the head coach and say “ Coach, I think yelling at Johnny without telling him what he needs to do to fix, might not be a great way to get through to him, how about we let him know what technique he should be using and lets see if it helps him. What do you think?” By working with the head coach, he knows you are an ally and are trying to truly help the athlete, the other approach, the gossip one creates division and only causing more problems. #4 Empower the team by boosting your leader, thereby becoming a leader. One of the biggest mistakes people make when working for a boss or being an assistant on a team, or even being a parent that has an issue is the mistake of screaming complaints to anyone that will listen. This just eventually gets back to the leader or director and just falls on deaf ears. In fact, more than likely this type of approach will create a negative feeling towards the individual or group and will be very difficult to repair. As a head coach if a parent is a negative nelly in the stands or complains about unwarranted issues just to complain, essentially all that happens is that coach is less likely to help you when you need it most. My favorite is when a parent will complain about a coach about playing time or getting the ball or someone not liking them and then go back and ask that same coach with help getting into college or with recruiting. Do you really think the coach is going to give you the same effort he would give you if you were a supportive parent or one that offers solutions. Simply knowing your place is important. In today’s society everyone thinks because they have a smidget of information on a topic, then that qualifies them as an expert. The answer is no, you are not an expert, inform yourself, approach humbly, get permission and then offer solutions. This is just common courtesy and despite this not being so common anymore, it is the right way to do things. Instead of trying to get your way, figure out how helping the leader, boss or head coach improve his situation and you are way more likely to get your way. Leaders are human beings just like you with feelings and thoughts and if you understand that and then approach them by helping their situation get better, then I guarantee 9 out of 10 times you will not only get what you want, but most times you will get more than you bargained for. In business and coaching, I cannot tell you how many times I hear people say, i am not kissing his but, I am doing my job but I kiss up to no one. It is the silliest thing I have ever heard. If you want the boss to promote you, you better help him solve problems, you better talk to him and you better help his situation improve or else you will have your false bravado and be unemployed. The leader has to care about his subordinates, players or assistants but in order to make your world better you must make his better. People love to say, “ I did it and my boss still screwed me” well yes maybe occasionally that does happen, but I guarantee if you helped your boss win, make profits or win a championship, I am sure you will be taken care of. If you aren’t taken care of, in time that leader will lose his respect and he will have issues. One of the most interesting things I learned as an assistant was to do whatever was asked of you, because if you want to be a leader, you first have to learn how to follow, earn your place, and then you will be given responsibility that will help you lead. Finally, its ok to be strong, but never cut off your nose to spite your face. If you are willing to burn the boats, you better realize that you will never be able to go back. Burn the boats analogy works in warfare and in coaching a game in the championship, but doesnt work when you have to show up at practice or work the next day. It just makes your environment a very very tough one and very likely you better make preparations for getting a new job. David Schuman @nucfootball on twitter, @nuc_football on Instagram and @daveschuman on instagram.